A week ago, I had the pleasure of meeting designer Nathan Turner at the Chicago Pottery Barn store, where he presented The Perfect Wedding Décor workshop. Seeing as I am helping plan a bridal shower and wedding taking place in the next two months, I diligently noted Nathan's ideas on arranging flowers, cheap and chic decor tips, and food service. This is not a spanking new idea, but I loved how scaled down this candy buffet is. 1. Mix up the shape of the serving dishes. They should be varying heights and widths. 2. Try and stick as close to the event color theme as possible. All pastels. All green candies. All pinks. 3. Make sure to have little goodie bags at the table so guests can scoop their favorite candies and take them home as a favor. When serving food buffet-style, whether it's a large bridal shower or a dinner party, wrap flatware in a napkin so it's one quick grab for guests. Tying the napkins with faux flowers, twine, or a ribbon make it both beautiful and practical by holding the set together. Set glassware on a tray for added dimension and sparkle to the table. Similar to the candy bar, make sure serving pieces on a buffet are of varying heights. Nathan mentioned there is nothing more boring than seeing a long, flat table with no interest. Three-tiered stands and raised cake platters are a great way to bring in dimension. Candlesticks, flower arrangements, and a champagne bucket all help spruce up what could be a very boring presentation. Nathan kept stressing that YOU DO NOT NEED TO USE A VASE for your floral arrangements. Here he's showing how he used an oasis (green foam) in this champagne bucket to prop up peonies. How grand for a gift-drop table or the name card table at a wedding? Above you see Nathan made use of a soup bowl, pitcher, and cappuccino cup. 1. The striped vases and votives you see are actually clear vases wrapped in paper from The Paper Source. All you need is double-stick tape! 2. Use coordinating paper (the stripes and the hydrangea) to mix it up without being too matchy-matchy. 3. Look at the bouquet on the right. Nathan noted how we all see little Granny sneaking away, weighed down with the huge centerpiece at the end of the night... he suggests making take-away bouquets and adding a little note, "Take me!" Much easier for guests to grab and those expensive flowers won't go to waste! And bunching three in a single vase gives the appearance of a full floral arrangement. Another affordable centerpiece option is placing small bud vases along a lengthier table with little votives scattered throughout. Nathan said this was one of his favorite techniques when he hosts dinner parties at home. It would also be pretty on a buffet or side tables in your house. I got to hang out with Crystal at the event. She is also hosting this same giveaway today, so make sure to pop on over to Plush Palate for another chance to win! With the man himself. Nathan Turner. He had on such a great outfit! 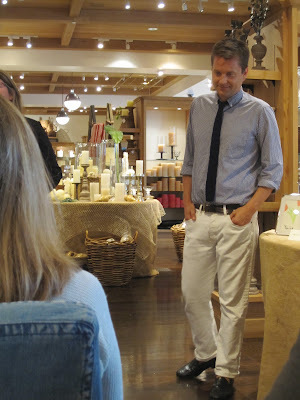 It was a blue checkered shirt, skinny knit tie, and loafers sans socks. And don't get me started on the thick-rimmed glasses (shown in previous photos). 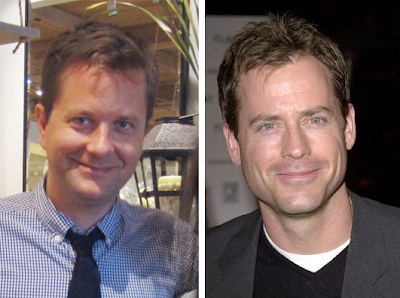 ...and because I love playing this game, I just need to point out how much Nathan looks like Greg Kinnear, one of my favorite actors (Little Miss Sunshine, As Good As It Gets, You've Got Mail). 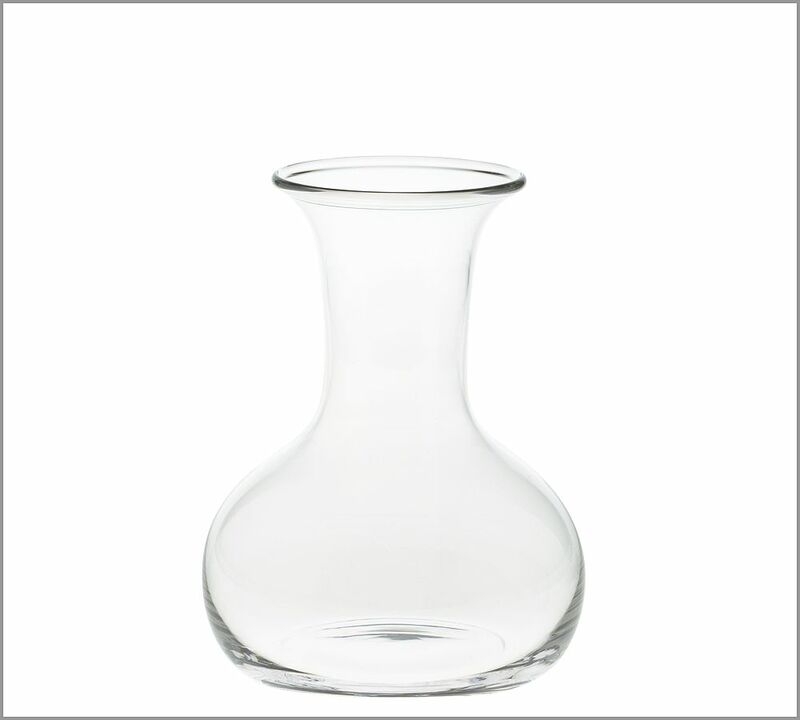 Pottery Barn is offering this beautiful medium-sized Villa Bottleneck Vase to one lucky winner! 2. Comment on this post with your favorite Nathan Turner tip to enter for the giveaway. Winner will be announced Monday next week! 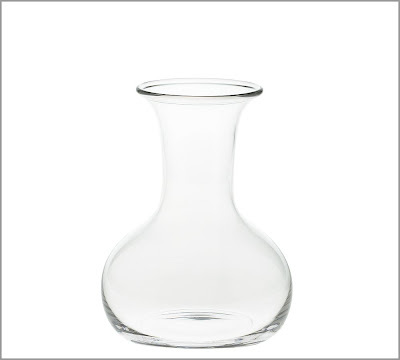 **UPDATE: Congratulations to Torrie for winning the Villa Bottleneck Vase from Pottery Barn! Thanks to everyone who participated. Wrapping jars in decorative paper is SUCH a great idea! My favorite tip is a tie between varying heights of serving dishes on a buffet table and flowers don't need to go in vases - think outside the vase. I like the tip about using a non-vase item to hold flowers. I love that he noted you do not have to have a vase to put flowers in...I do this all the time and now I know I'm not crazy! Love the Take-away-bouquets! What a great favor to give and makes a large centerpiece when all combined in one vessel per table! I love his tip to put flowers in a champagne bucket - so chic! I'm a follower. I love the unique flower vase idea, and that buffets need to be varying heights. Also - the "take me" notes so people know they can take the flowers home - brilliant! I am also a follower, and I LOVE the peonies in the champagne bucket!! So, so classy! What a fun seminar to attend, and thanks for sharing! Great tips! I love the idea of wrapping paper around the vases. That way everything coordinates for a punch and who cares what your vases look like! The striped vases and votives you see are actually clear vases wrapped in paper from The Paper Source. All you need is double-stick tape! While it is not necessarily new, I love all of the different sizes of arrangements. I tend to stick everything in one vase. wrapping the votives and vases in decorative paper is a great idea! love it! I love the glasses on the mirrored tray...who needs a wedding, I just might do that in my house! I love the tip to put glasses on a tray...so simple and so elegant. Love it! So much great advice! I love the tip about wrapping utensils in napkins for a buffet. Useful and a way to add a pretty visual to your table. Love the take away bouquets...I work with a wedding decorating company and we're always trying to get rid of the flowers at the end of the night, this would be such an easy way to do it & make everyones day! I love the paper wrapped take away bouquets. I wish I had thought of this when designing my tall centerpieces for my wedding. I also love paper wrapping the vases. I have some scraps I'd love to try that out on. All of his tips were fab, but how great was the tip about wrapping silverware in individual napkins and tying with a decorative object? It's not something I've ever thought about, but I know it's something I'll be using when I plan my BFF's baby shower! I love Nathan's tip for arranging flowers in unexpected items- pitcher, bowl, etc. Definitely using this one at home! But I wouldn't mind that precious little bud vase you're giving away! It's hard to decide what my favorite is. Possible I love the votives and vases wrapped in paper. It's hard to not love anything Pottery Barn! I love putting glassware on trays! I love the idea of putting flowers in anything other than vases - so much more creative and interesting! Great tips! The tip for take-away bouquets is brilliant! Lately, I'm really loving the idea of putting flowers into pitchers, canisters, etc. It's not a monumental concept, but it's creative and different. Love it! Im a follower!! I already use different pieces around my house as vases... So the tip I liked was making sure serving pieces on a buffet are of varying heights. Thats so true and im guilty of having a flat table! I like the use of the unconventional vases..brilliant. I am a follower and really hoping I win!! what a great giveaway and blog! 1) I follow your blog. 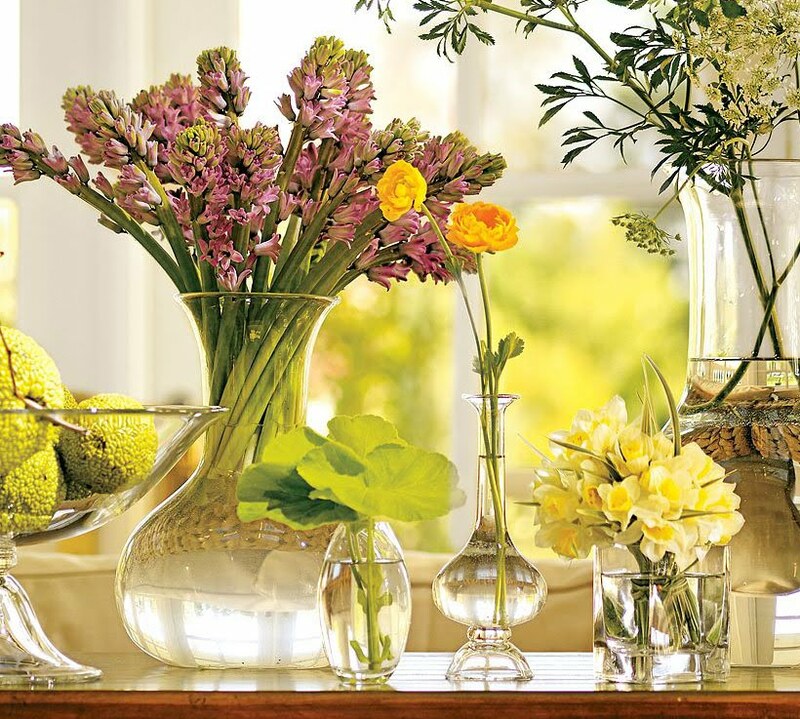 2) My favorite tip is that you do not have to use a vase for your flower arrangements. Great tips...just wish I had a party or wedding to plan for. such great tips!! I love the idea of having votives that are actually clear vases wrapped in paper from The Paper Source. Good tips. I like the one about using small bud vases throughout a lengthy table. I love Nathan Turner and your blog. Anything on a tray adds to the beauty. I love a tray of empty glasses just waiting for their prospective drink to be poured. Something about being served and loved by a hostess! I love the idea to wrap the vases with the paper from the Paper Source. I've seen that done and never knew how they did it. Hey! I absolutely love the idea about putting flowers in the champagne bucket. We always just rush for a glass vase to put flowers in. This is such a great idea and makes a much more dramatic statement! I love the paper wrapped around the clear vases, how clever, casue we all have too many clear vases! I loved the tip to use small bud vases with votive candles. So simple, but it looks amazing! My favorite tip was the take away bouquets! I love Nathan's tip about putting flowers in containers other than your typical vase. I'm already dreaming up great uses for my trifle bowl and some of my pretty pitchers. I'm going to wrap jars in decorative paper! That was a great tip! My favorite tip is to use small bud vases and votives on longer tables. I did this at my wedding and loved the look! I'm a follower of you and I love the idea that you can put flower arrangements in other places than just a vase. the tea cup was so cute!!! I love the food service ideas of using a theme of colors. I will definitley be using fake flowers to tie my napkins, as well. Flowers are perfect for any occasion. Today number of local florists is available who make special arrangements for the great occasions like weddings, birthday's parties, and all other miscellaneous occasions.